Al Capone had been brought to Chicago from New York in late 1919 to help Johnny Torrio, his mentor, operate a network of brothels and gambling establishments. The introduction of Prohibition, which made it illegal to manufacture, sell or transport intoxicating liquor, on January 16, 1920 was a godsend to the numerous gangsters in Chicago. Capone’s willingness to employ violence combined with Torrio’s business sense and contacts in city hall ensured that their outfit became one of the dominant gangs. Torrio negotiated an agreement among the various gangs to cooperate, rather than pursue bloody and meaningless squabbles over territory, but it fell apart in late 1924. The resulting Beer Wars drove Torrio to hand over the business to Capone, as open warfare broke out between Capone’s syndicate, supported by the Sicilian gangs, and the Irish gangs, loosely allied with Polish and Jewish gangsters. The war took a deadly toll on both sides, and Capone himself barely survived several assassination attempts. By late 1926, enough people had died that another truce was arranged. Capone’s syndicate had become the alpha gang, controlling half of the city, and he even played a leading role in ensuring the re-election of a mayor who could be relied on to ignore the astonishingly lucrative business of selling people alcohol. Embracing his fame, Capone became the symbol of the lawlessness in Chicago, which attracted the attention of the federal government. 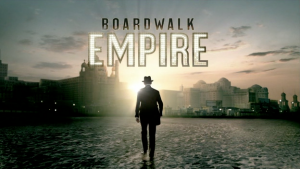 Al Capone, a former member of the Five Points Gang in New York, is brought to Chicago in early 1919 to be the new bodyguard for Johnny Torrio, the right hand man of Big Jim Colosimo, the leading gangster in the city. Prohibition is about to start and Torrio intends to make a fortune selling illegal alcohol. An attempt to arrange a deal with the North Siders, led by Dian O’Banion, fails because Colosimo had repeatedly refused to get involved in bootlegging, and he has the political connections needed to ensure that the police do not intervene. Once Colosimo has been removed from the situation, Torrio and O’Banion divide the city between them. Capone’s loyalty and ability to use violence to resolve problems convince Torrio to make Capone an equal partner. Unwilling to accept the status quo, O’Banion double crosses Torrio, who responds by having O’Banion killed in his own flower shop, which causes open warfare to break out between the gangs. After surviving a retaliatory assassination attempt by the North Siders, Torrio goes to jail for safety and hands over the operation to Capone. Fed up with Bugs Moran, O’Banion’s successor, moving into his territory, Capone arranges for the assassination of Moran and much of his gang during the St. Valentine’s Day Massacre. Although he has finally achieved dominance over Chicago’s underworld, Capone’s international notoriety had attracted the attention of the federal government, which works with local police to destroy his organization and charge him with income tax evasion. The opening narration claims to show a ten-year-long battle between the city of Chicago and a ruthless, cunning criminal, except that the city did not fight Capone and the other gangsters. Groups of upright citizens did struggle against the gangsters, later symbolized by Capone, but most people were happy to buy alcohol, even though it was illegal, and most members of the police and the municipal government either accepted bribes or looked the other way. If the city had actually fought Capone and the other gangsters by refusing to break the law to quench their thirsts, the gangsters would have simply been low-level thugs and Capone would have never become an international celebrity. The basic chronology of the story is correct but a number of changes were made to simplify the narrative. The screen Torrio is presented as being reluctant to arrange a permanent retirement for Colosimo, but the real Torrio made the decision, and was not pressed by Capone, who was only a bodyguard at the time. Colosimo was probably killed by New York gangster Frankie Yale, who does not appear in the movie. The movie stresses the dependence of the gangsters on bootlegging-friendly mayors, who permitted them to run their illegal businesses openly. When Big Bill Thompson, the corrupt and cooperative mayor of Chicago, lost the 1923 election to a reformist, who cracked down on bootlegging, gambling and brothels, Torrio did take control of the nearby town of Cicero through bribery and intimidation. Unwilling to acknowledge a clear victory by the gangsters, the film claims that the state capital had only learned of criminal interference in the democratic process after the syndicate had won the election in Cicero, instead of showing the afternoon-long battle between Torrio’s syndicate and the two hundred policemen who had been hastily imported from Chicago to ensure a fair election. Capone’s brother Frank died in the fighting but Torrio still ensured that his candidates won the election, despite the presence of the additional police. The arrangement negotiated by Torrio after Colosimo’s death kept the peace for several years but the Chicago underworld in the early 1920s was a confusing landscape with numerous gangs struggling with each other to gain more territory. The main gangs were the Torrio-Capone Syndicate; the O’Banion gang, based in Northeast Chicago; the Gennas, a Sicilian family who obtained their bootleg liquor from hundreds of small copper stills in tenements and shops in the South Side; the O’Donnells and the Druggan-Lake gang on the West Side; the Saltis-McErlane gang on the Southwest Side; and Ragen’s Colts on the non-Italian part of the South Side. That was apparently too many gangs for the screenwriters, who trimmed it down to the more manageable number of four: the Torrio-Capone Syndicate, the O’Banion gang, the Gennas and the Murphys, who appear to be standing in for the O’Donnells. While the Gennas are mentioned, they never appear in the movie, even though O’Banion’s feud was with the Gennas, not Torrio. Admittedly, O’Banion did tip off the police to arrest Torrio at a brewery, but the double cross had simply caused Torrio to wash his hands of the leader of the North Siders, giving the Gennas permission to kill O’Banion in November 1924. It is true that O’Banion, one of the most powerful and brutal gangsters in Chicago, owned a flower shop and took pride in the fact that he supplied all of the flowers used for the big gangland funerals. The sequence of events that followed O’Banion’s death has been altered slightly. The real Torrio had plead guilty to bootlegging charges in the hope that the situation would have calmed down by the time he got out of jail, but Hymie Weiss, O’Banion’s successor, found him before he went to prison. Barely surviving the assassination attempt, Torrio waited until he was safe in prison before handing over the operation to Capone. Weiss did lead a convoy of cars filled with goons who machine-gunned the restaurant where Capone was eating but the real men stayed in their cars. Capone probably would not have survived if Weiss’ men had left their cars and moved close enough to the restaurant to actually aim properly. Martin Basalm’s corrupt reporter is based on reporter Jake Lingle, who was a fixer for the gangsters. Lingle was not Capone’s errand boy, but dealt with all of the gangs, and was killed simply because he had become greedy. City Hall did not ask Capone to take an extended vacation until after the city elections had ended. In fact, Capone had been an extremely generous contributor to the 1927 campaign to re-elect Bill Thompson as mayor, donating $250,000 and the use of a thousand hoods. The presence of 5,000 policemen at the polling booths had prevented overt intimidation of voters, but Thompson still won and Capone was given preferential treatment by the mayor’s office. Capone decided that a change of scenery would be beneficial when Mayor Thompson decided to clean up his image for a presidential run by permitting the police to enforce the law. The departure was announced during a press conference where an offended Capone complained that satisfying people’s thirst for alcohol was a thankless job. A surprised Capone discovered that not every city was eager for the business of a famous, big-spending crimelord. A visit to Los Angeles was cut short when the police asked him to leave, and several other cities announced that he was persona non grata, until he made himself welcome in Miami Beach by patronizing businesses run by the leaders of the city’s political establishment. The 1928 Chicago election was honest despite Capone’s traditional interference because the citizens were fed up with the uncontrolled violence, and rejected the previously unbeatable Thompson machine, ensuring that all of Thompson’s candidates lost office. While Capone had diversified his business holdings and had acquired a number of legitimate companies, his headquarters were located in the Lexington Hotel, not a building in the financial district. The syndicate did extort protection money from businesses, but that revenue stream was fully developed only after the repeal of Prohibition on December 5, 1933, which had removed the gangsters’ primary revenue source. 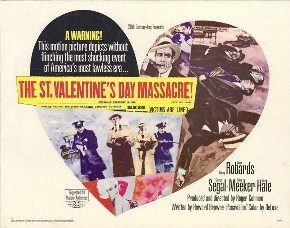 Although Jack “Machine Gun” McGurn, one of Capone’s top henchmen, had planned the St. Valentine’s Day Massacre, not Capone himself, the screen portrayal of the massacre is correct. However, feared hitmen Albert Anselmi and John Scalise were killed by Capone because they had betrayed him, not in revenge for their role in the massacre. Furthermore, the massacre had occurred before the Atlantic City conference that welded together Italian, Irish, Sicilian, Jewish and Slavic gangs into the Commission, which regulated gangland disputes. The formation of the Commission is ignored by the script, possibly because its existence was not common knowledge in 1959. However, the real Capone did arrange to be arrested for possession of a concealed weapon to be safe in prison while tempers cooled because he had offended the members of the Commission with his refusal to tone down his public notoriety, which had attracted unwanted attention to the other gangs. Even though federal investigators had already convicted Capone’s brother Ralph of income tax evasion Capone still dismissed their threat, and he appeared to be as powerful as ever. Moreover, the idea that all of Capone’s records were neatly organized in a filing cabinet waiting to be seized by federal investigators is laughable. Capone was much harder to convict than his brother because he had no bank accounts, no property in his name and he always paid cash. The IRS investigators examined hundreds of ledgers that had been seized in various police raids, and spent months poring over roughly a million documents without success until a key bookkeeper was arrested. The length of the sentence was a shock to everyone, especially Capone, who had expected a year or two, which would have enabled him to continue to run his business, not eleven years. 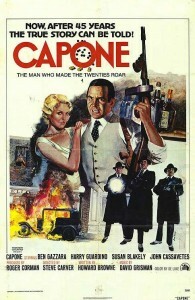 Although the script explains that Capone was released from prison because he was suffering from an incurable disease and died soon after, it does not say that the disease was syphilis because the mention of venereal diseases was forbidden by the Motion Picture Production Code, which was still enforced at the time. Steiger’s Capone has a frightening menace and he has a good physical resemblance to the actual gangster, but the real Anselmi and Scalise were much, much harder than the men in the movie. The subplot of Capone’s romantic pursuit of the wife of a man who had been killed by Capone is creepy and unnecessary. The real Capone was happily married and had a family, although he kept mistresses. 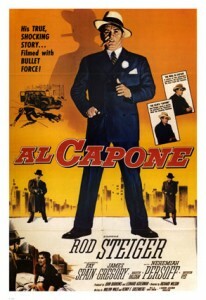 The movie was praised at the time of its release for its accuracy, and Steiger comes closest at capturing the real Al Capone, but the film is limited by the need to show that crime does not pay.